Many cucumber seeds on the market today are bred to produce white fruit. They often have the word “white” or “pearl” in their name, and the cucumbers are very similar to green varieties in flavor and texture. If you have planted green varieties and get white cucumbers instead, however, then it’s time to look for problems. One reason that cucumber fruit turns white is a fungal disease called powdery mildew. This problem begins on the upper surface of the fruit, and the cucumbers may look as though they have been dusted with flour. As it spreads, the entire fruit may become covered with the mold. Powdery mildew usually occurs when the humidity is high and air circulation is poor. Treat powdery mildew by making the environment around the cucumber plant less hospitable to the disease. Thin plants so that they are spaced at a proper distance, allowing air to circulate around them. Use a soaker hose to apply water directly to the soil and avoid getting water on the plant. 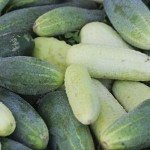 Two common cucumber plant problems that cause white fruit are blanching and excessive moisture. Blanching occurs when the fruit is completely covered by leaves. Cucumbers need sunlight to develop and maintain their green color. You may be able to position the fruit so that it receives enough light. If not, snip out a large leaf or two to let the sunlight in. Excessive moisture results in white cucumbers because water leaches nutrients from the soil. Without the nutrients needed for proper development, cucumbers turn pale or white. Correct the problem by feeding the plants with a fertilizer high in phosphorus and watering only when necessary. Your cucumber plants can trick you into watering them too often. Water evaporates rapidly from the large, flat leaves on hot, sunny days, causing them to wilt. There may be plenty of moisture in the soil, but the roots can’t absorb it as fast as it is evaporating. To determine if the plants need watering, wait until the end of the day when the sunlight and temperatures are less intense. If the leaves revive on their own, the plant doesn’t need watering. Otherwise, it’s time to water. 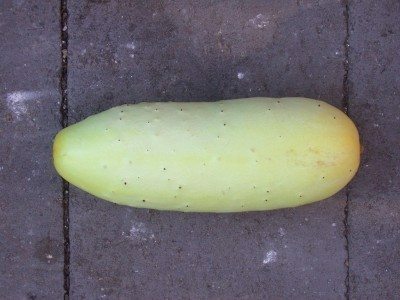 Is it Safe to Eat White Cucumber? It’s best not to eat diseased white cucumbers. Those that are white because of blanching or too much rain are safe to eat, although nutrient deficiencies may result in a significant loss of flavor.